All articles were spell checked, things should be quite less embarrassing now. There are some new charts for my database, drawing single parameter for a time range of all the cards. I might draw some more interesting trends later. I really wanted to expand the functionality of this site over summer. After a dive into stinky php I found out mysql queries are failing whenever there are any quotes in them. I can't find a solution to this madness, but at least I finally know what the problem is. In another news one more SKU is added, the STG2000 variant of first Nvidia chip NV1. I managed to get one more or two more games running with them. New data in database: die size, texture cache, and L2 (texture) cache. These parameteres are getting more attention recently, so I will try to collect them. More columns to come. Plan for next month: review of one really old chipset that can barely play anything. Sweet. This month I was looking back at Matrox cards, for two good reasons. Firstly new documentation that allowed me to drop few details on their architecture, secondly I got most of low resolution tests working. Last missing data is from 512x384, which I could get to work only with G100. There is even more to G100, I rejected the usual assumed clockrate of ~40 MHz. This came from supposed inheritance of divider by 3 used for older cards, and tools like Powerstrip are counting on it. Matrox register documentation claims 3 as only divider, but at the same time specifies reference clock of G100 as 71,5/143. That optional divider of 2 would explain how can my two G100 cards with very different system and memory clock perform as they do. I don't see any other reasonable explanation, so cards tested are now considered to have a lot more rational chip clocks of 62,5 or 66 MHz. Never enough time. But this month I finally reviewed card with Permedia chipset, and it was quite a battle with driver, no wonder others gave up on her. That was another missing piece in the puzzle, that is now almost complete. Almost, so good luck in 2014. More delays, so hopefully Christmas will provide me with enough time. RIVA 128ZX data are in and hopefully it is not last addition. Textures per TMU column was removed from the complete database view, it got too dull. Could do texture/shading ratio instead or other interesting trends of contemporary graphics. Still not finished, but let me throw some shameless self praise after thinking about this project. It ended up more resourceful than expected. Hopefully my work helps to correct some false opinions about old graphics cards that are still sometimes circulating on the internet. For example the "deceleration" of Virge, how Rage IIc is some cheaper Rage Pro, VT4 being 2D only, G100 having single TMU, triangle engine of Vérité doing triangle setup, the list goes on. 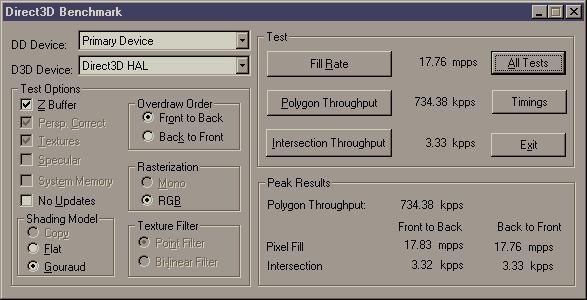 I shed some light on texturing problems of 3D Image, d3d abilities of Imagine 128 II and Millennium. Discovered the differences within 6326 family, the two Laguna3D chips, several Mystique SKUs, performance differences between Virge/Trio3D generations, inefficiency of Voodoo Rush. I learned what infinite planes actually are, how many takes on blending operations there were, that some AGP implementations actually are helpful. I played games on the slowest of slow, on a DSP chip, on semi-professional cards, gazed in wonder at output of AT3D and admired one more time Voodoo Graphics. I feel tired and satisfied. It is quite exciting to relive the first, and most dynamic years, of consumer 3d acceleration. From the struggles of NV1 to the maturity of i740, there are so many different implementations, and the chips are still holding more secrets to be uncovered. Still compiling over 5000 results... Riva 128ZX will be added. The conclusion is not here yet, but for a good reason. I acquired Mpact! 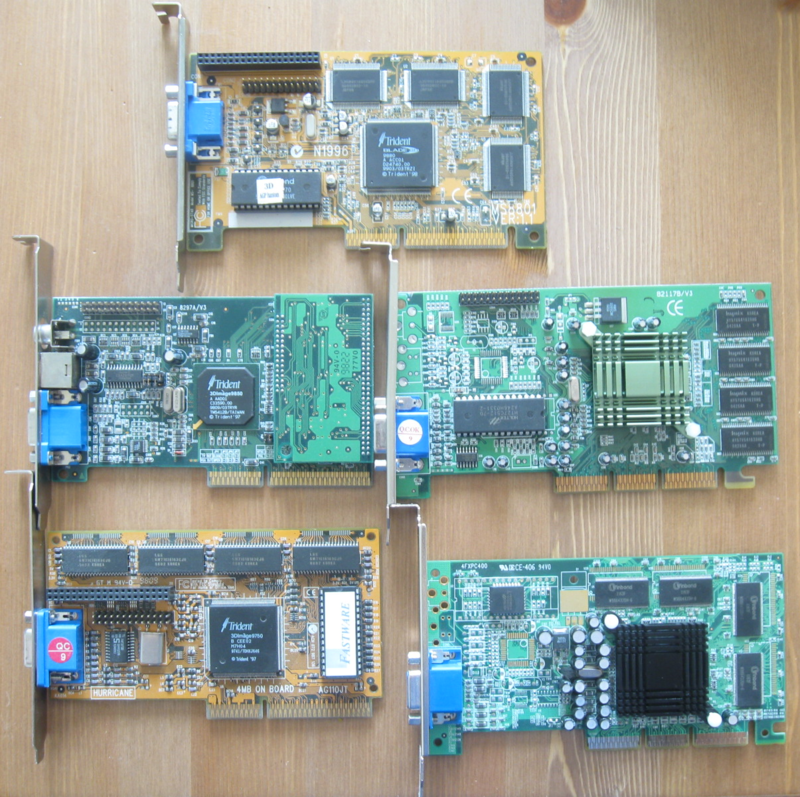 2 8MB and Laguna3D PCI 4MB cards. After the memory management issues of Mpact 2 4MB I expected better experience with more memory, and that indeed is the case. 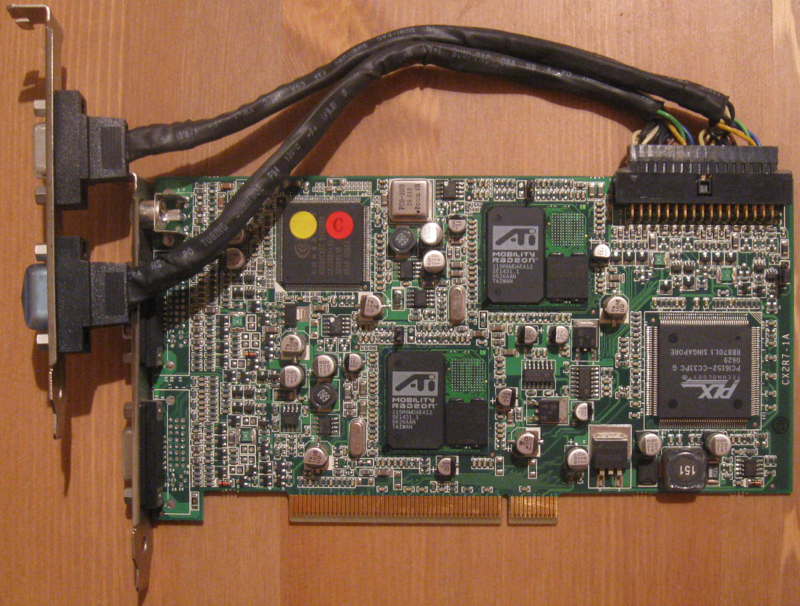 The Laguna3D PCI on the other hand was more surprising. Broken/missing features of CL-GD5464 can put it among early big failures of the industry. So there are two more SKUs, raising the total number tested to ~45. Way more then what I imagined when starting this. Oh, and here is sweet Netvision 2500i. 3GA chip by Artist was one of those early texture mappers that did not care about games. I want to examine it anyway. Another month when not much happened, I was merely updating the prolog. The conclusion is on it's way, because in addition to my job I will start university in September, making the deadline clear. My intention to provide some historical prolog to the content of the web turned out more difficult. Just for the sake of update I will publish it, even if it is far from good. My lazy month has passed. While there was nothing new on the main project, there is part of the web which is being updated continuously- the 3d accelerator database. It will soon reach size of 500 standard SKUs, sorted by real games performance (to my best knowledge). Needless to say this also took lot and lot of time. In June I would like to do some summary. There is not much more to do, until I get missing cards. Benchmark results should now be almost completely published and with navigation menu as requested. Turok is giving me trouble, many results, both from the screen or frapsed and both average and minimal, seem way remote from realistic performance. I am on a tight schedule in May so there is not much hope for big updates. Well, this was really a lazy month. No new article, only revisions of old ones. I am continuing as usual, just slowly gathering last results. It took me a while, deciding on what I wanted to test. Inevitably, I was learning by doing, and fell into some redundant activities. Looking back I put every card for some additional test run around four times on average, because of revised methods, added tests, corrections and confirmation. Granted, I am getting tired of it, but the finish line is really near. Then will come publishing the results in a better way, programming some nice custom views, and moving onto something else. As planned the 3D Blaster PCI was tested and V1000 article was significantly rewritten. Next I expected to do 6326DVD review, with slow memory it would be the bottom offering of SiS. But when I saw 6326 C1 in action priorities have changed. It turned out there was yet another chip with broken perspective correction and there are other differences in 3d engine as well. This rougher than previously known entry of SiS into 3d world caused second major rewrite. C5 and DVD tests may come later, if I will be bothered with the gap. Another month without new article? It ain't the end, I was just cursed with a few hardware failures. This Christmas brought my way Creative 3D Blaster PCI with first Vérité chip and also few cards with early revisions of SiS 6326. What a rare blessing from local auction, those cards will soon be tested. I still did not publish all of my results so far, actually got somewhere to the middle of it. But from now on I am also transiting to database, which should allow more customization and interactivity in the future. All the best to 2013, the year when hopefully this project will be wrapped up in proper fashion. This month no new articles or purchases, time to save something for Christmas. I was correcting older texts though, some mistakes were quite big, fortunately rather language related. As you can see I am testing adds, wanted to have some help with hosting costs. I doubt they will make anything substantial, so probably will be removed soon. Not much progress with graphs, but there were other updates. First I added results for first Mystique in slowest variant. After playing with Trident Blade 3D I got a clue about AGP of 9850. With adjusted setup the card performed considerably faster, so I rebenched it from beginning. Finally, there is now review of the unlucky pioneer NV1. I have begun the compilation of results into graphs, you can see them under results. It is a pure framerate for now, for all important image quality details stick with galleries and reviews. Finishing those should be my task this month. I am thinking about some IQ coefficient to express more complex results, despite the dangers of subjectivity. Still lots of things to do, but got to say I am satisfied with my work so far, I dare to say it far exceeds anything done before with first generations. Hopefully my own Diamond Edge 3400XL will arrive soon. 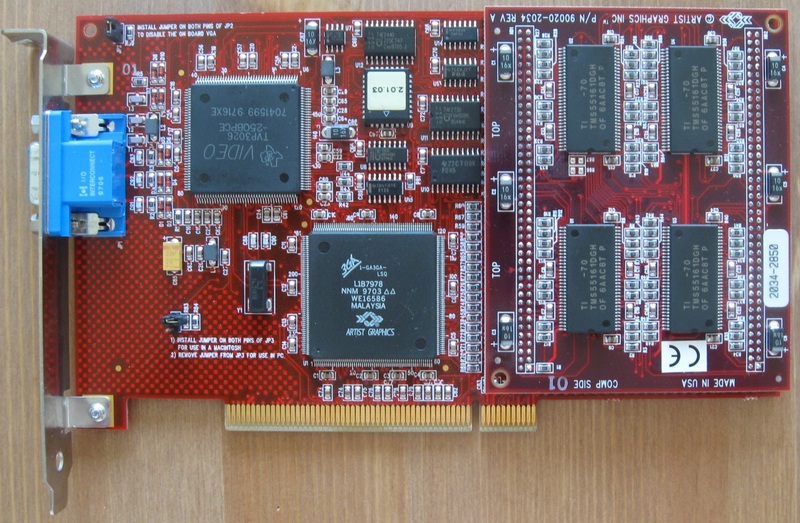 Seeing how there is little hope now to get NV1 card for less $100 to start from the beginning I wrote article for last vintage3d related card in my possession- Riva128. I am going to continue looking around for missing cards and hope for help of similar minded people, but do not expect many interesting updates from now on. If time will allow me, I will compile measured data into graphs game by game. I may add one more test though. Out of necessity for cards without hardware texture mapping, but applicable to others as well, the "d3dtest" from earliest DirectX SDKs can help me determine at least a bit of performance for the most feature poor chips. As expected, the Imagine 128 II looks faster than the Millenium (60 MHz), though the Matrox chip can do important z-buffering. Fiddling with particular options did not change results of those two. On the other hand Imagine II supports specular highlights. Click on the image to see its result. Oh, and vintage3d.org made it into first birthday. I am done with ATI, but galleries will be completed later. My flash drive with pictures died... Anyway, I was precising articles and database as usual, but nothing worth writing about happened, had more of RL. My first Volari card arrived, it is humble V3XT PCI. I feel bad for not completing ATI reviews yet. However, there is no need to rush. The only other card in the queue is Riva 128 and I don't feel like starting with Nvidia before some NV1 comes my way. Maybe I could show here some purchases, since this is inevitably also about collecting. And I have a long way to go. In June I got this NEC TE5L, not sure if it was worthy for collectors, but multichips are always interesting. The Virge series was really feeling incomplete without Trio3Ds, now it is done. I will finish Number Nine article very soon. Next month I can dive into ATI cards. Thought I should write something new here as well. This project is taking more time than I thought, but I can see the end coming at late summer- one year since the start of the web. As expected, some cards are almost impossible to get so things will not be as complete as I wanted. This is where you can come in. If you possess a rare vintage card fitting my scope I would much appreciate even a lend for one or two weeks. I know collectors don't want to give out their treasures :] That does not mean I will let this web/idea rot. I may be updating articles with new information as I am doing all the time and I can also later venture further to some newer underdogs, which were not really covered in press, SiS and Trident comes to my mind. The web side of things is depressing, writing things from scratch is not what I have time to spend on these days. I am getting over 1000 visits per month, which is what I expected. Most of it will be people still looking for drivers or other unrelated stuff. Not that I care, but some good template could make this web more pleasant experience and download section should do no harm either. I am getting linked more. Let me clarify my nick has nothing to do with Latino languages.